Here’s to a healthy and happy 2019 for all!! Thank you for sharing, I am smiling ear to ear. I hope your Christmas was Puuurfect… and I wish you a healthy prosperous New Year!! Looks like we both were unsubscribed, Jackie, as I just checked and saw your post. Thanks for the good wishes – same to you in the coming year! Sky is doing so very well. Still quite spoiled and I guess that’s our new normal. I’ll take it! Sorry, I’m late to the pawty. Awe Sky got a kickaroo and loves it. They are great for tripawds because they are large and can grip with three -front or leg amps. Glad to see everything is going well! I cant even tell Sky is a tripawd in this video! Happy New Year back to you and Purrkins!! He loved that toy – until Marlowe loved it too and tore the stuffing out of of it! I’ve seen him snuggling the pathetic shell of it so will probably buy another .. but knowing it’s time is limited before Marlowe has his way with it. Sky is doing great! He is snuggled up with me right now. Happy camper! Still steadfastly refuses to use steps to bed but I remind myself how lucky I am that he is here and healthy. He is still on gabapendin twice a day mostly for spinal issues and Prednisolone for IBD. I’m thinking of trying CBD oil to see if I can stop the Pred. It’s legal here in Oregon. His weight is good and he is a joy to behold! Thanks for checking in and I hope that the year treats you both splendidly!! I think I would replace and put it up when Sky isn’t using it. I hope the CBD helps with the IBD it will help with Sky’s arthritis/spine you might be able to cut back on the gaba on it. We are using it for Saxton for anxiety and its a miracle in a bottle imo. We used it in Purrkins when he was first diagnosed before we took the leg. He hated it so bad it tastes terrible. Saxton is a dream kitty to medicate so I don’t have any issues getting into him. If you didn’t get a chance look into the Slipper elm to try here is a link to investigate scroll down to the slippery elm. I do think it is worth a try can’t hurt and could be Sky’s ticket to get off the pred. Worst case scenario it doesn’t work you tried and know. It’s not expensive and has many uses. Thanks, Rebecca we hope the same for you and Sky & the furmily! Let us know how the CBD works for Sky. Thanks so much for the link and info! I’ll try the slippery elm although it may be tricky to dose him. I do crush the Pred and mix in baby food and that has worked well for the most part. Sometimes I don’t get it quite small enough and he detect a bit which puts him off. But I really need to get off the steroids if at all possible. I found one by Lazarus Naturals that is taste free. It works pretty good. I have not done much with the kitties and cbd but i am thinking of trying it after seeing how well Mitch had responded to it. Thanks, Jackie! I just ordered a small bottle of CBD from Lazarus to try. May also try it with Marlowe’s luxating patella issues. Fingers X’ed! Will also get some slippery elm. But may do them separately to see which is working best. Any time! I have used their products for the arthritis in my foot also and it does a good job! I think separately is a great idea so that you know what is helping and if the other enhances that afterwards. 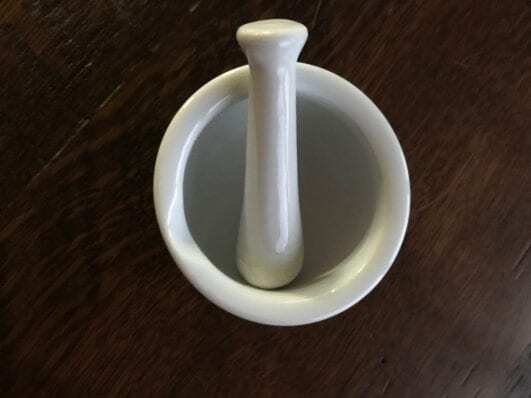 We use a mortar and pestle for pills we can crush. Do you have one by chance? It will pulverize that pred into powder. Sky won’t detect it that way in baby food or food because pred doesn’t taste. I got them on Amazon they are reasonably priced. I use them daily for the boy’s supplements. I agree only change only one thing at a time that way you know what’s working and what’s not. For the future slippery elm is lapped up most times by cats. It’s a little sweet I think. The boys never balked at it. Not all cats are the same either but hopefully, Sky wouldn’t mind it. Keep a little journal to look back on. Good luck & let us know all paws crossed! Yes I have an olive wood mortar and pestle. I was keeping it for spices but now that you mention it, I never use it. I was using 2 spoons to crush it. Mostly OK but not 100%. Good to know they mostly don’t object to slippery elm taste. Sky is easy so will probably be fine. Next time I’m at Whole Foods I’ll get some SE. I don’t go there as often since Amazon took over – quality has gone down. I’ll definitely keep you posted and thanks again for all of your help!! !